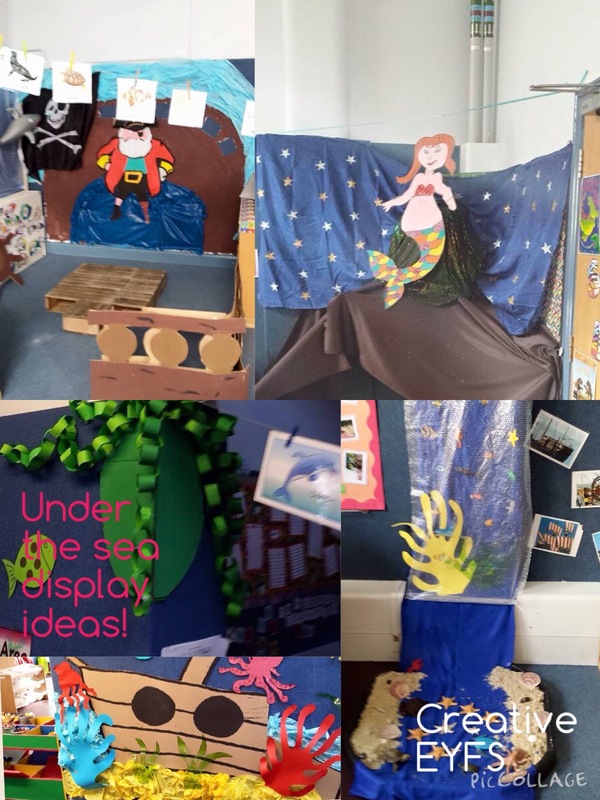 I like to create environment displays that are interactive and capture children’s imagination. 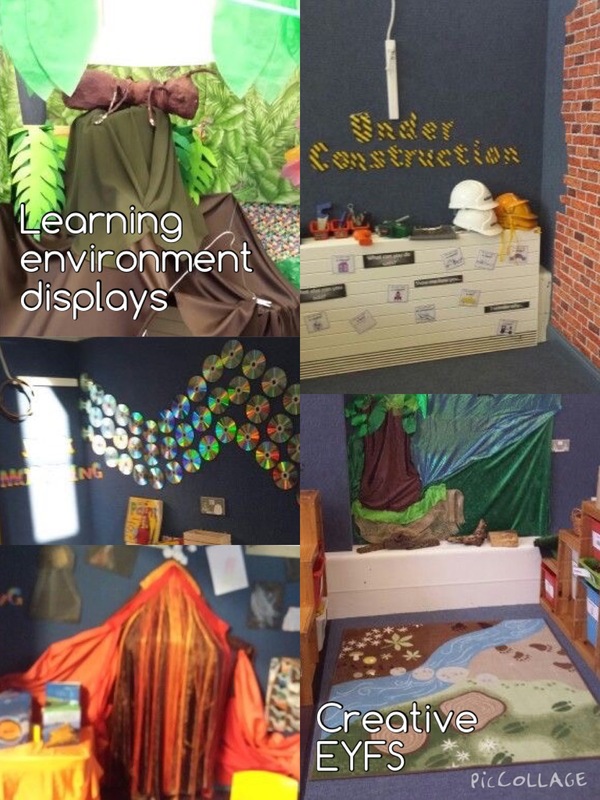 The displays need to be flexible and support the contin uous provision that is available, from bat caves to cascading waterfalls, cosy reading nooks to exploding volcanoes! 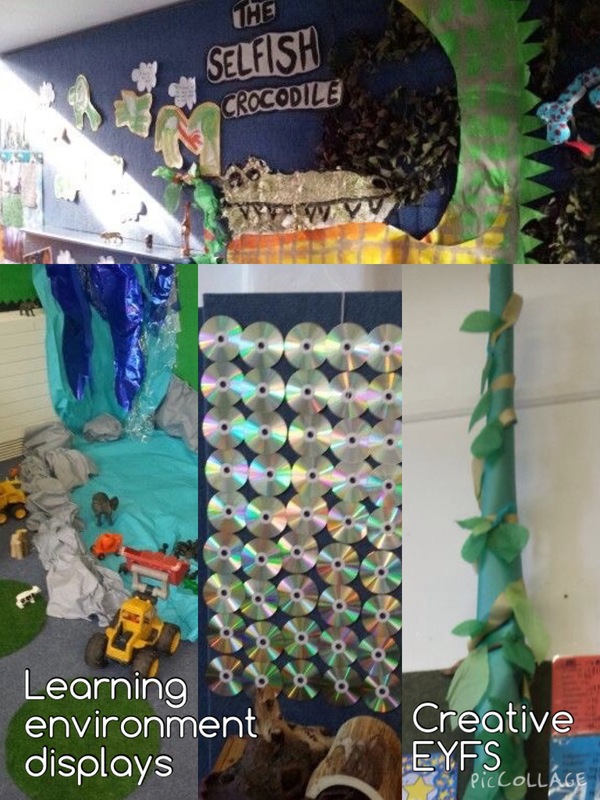 Each display within my learning environment has a purpose, whether it is to showcase children’s work or create prompts to help and inspire them during their play. 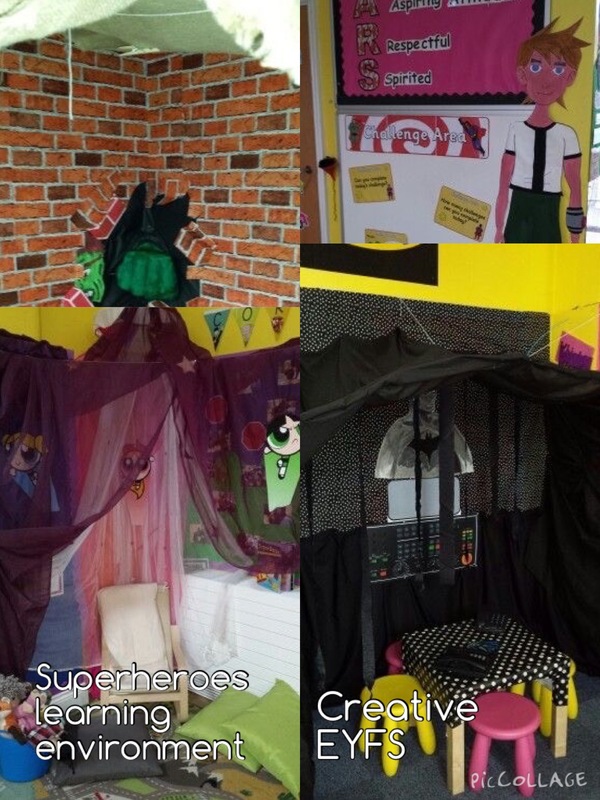 Below are a selection of photos of different displays that have been created to ensure children are supported and extended during their learning! Some of the displays are created as part of the initial hook to start a topic off, others such as the volcano came about through children’s interests, we were learning about dinosaurs and started to discuss why dinosaurs do not exist any more, the children came up with lots of good answers, one child in particular went home and researched about volcanoes erupting and came back in and bowled us all over with his enthusiasm, so out went the plan for the day…. a few videos were watched of volcanoes erupting, another visit to our school library to research and find books about volcanoes and after a quick rummage in the kitchen for baking powder and vinegar volcanoes were erupting all over the classroom, the children then took this further by using clay and motion sand to create volcanoes as well as using different medias to paint and collage what they saw. We also rummaged in the fabric box and found lots of colours we could use to create our own volcano display, the children then went about securing the fabric to the wall using staplers, hammers and nails (all supervised! ), we added the pictures we had made alongside photos of the clay/sand volcanoes and books from the library, a few comments about our learning and the children’s written observations and we were done… for that day any way, throughout the week the children kept adding to the display using different textures they found in our creative boxes, it was so much fun and the children could really talk about their learning! If we link this all back to the characteristics of effective learning, allowing children time to play and explore is about us as practioners understanding how to set up these environments so that they are engaging, inviting and exciting. We want children to be active in their learning, once they are hooked we then need to give them time and space to really involve themselves in their learning, if we have set up our continuous provision right, they have everything that they need to extend their own learning and can showcase and talk about it to others!